← Save up to $3,160 with Emerald Waterways’ sweet Suite Deal. 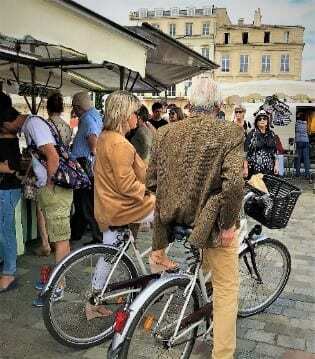 If you are lucky and have a beautiful day, Bordeaux is a fabulous city for walking and biking. I started with the outdoor food vendors at the Marche des Quais, Quai des Chartons, 33000. Everyone rides bikes and it is an excellent way to explore the city, shop, people watch, and spend a glorious Bordeaux Sunday. Look for local produce that is snapped up by residents and visitors. The array of fresh oysters, poultry, meats, seafood, cheese, olives, breads, spices, cakes, pies, soaps…all amazing, beautiful and value priced. Small cafes serve sandwiches and seafood, along with local wines. The area is perfect for children completing daredevil tricks on their skate boards, scooters and bikes while parents watch pridefully on the side lines, ready with a smile (and a Band-Aid). Directly across the street find a wide selection of restaurants that deliver European as well as Asian cuisine. Moelleuses-et-Persillees, Quai des Chartrons. Designed and managed by Adeline Pray and Giovanni Lombardi. The meat is sold by the pound and grilled based on request; unfortunately, small orders are not accepted. If you are looking for a piece of beef the size of a burger – find another restaurant. Beef selections are sourced from Galicia, Spain, Austria, Germany, USA (Black Angus) and EU (filet, chateaubriand). Read the full article at wines.travel.